Inspired by the historic sgian dubh, the Green Gem Scottish Fantasy Dirk transforms the traditional everyday weapon and tool into a beautiful collectible. This Scottish dagger features an elegant knotwork hilt and gemstone pommel. Both blade and hilt are made of solid stainless steel. The spear point blade features small serrations and a narrow fuller near the hilt, adding balance and versatility to its design. Made of hard composite, the black sheath sports a stainless steel tip decorated with matching textures. 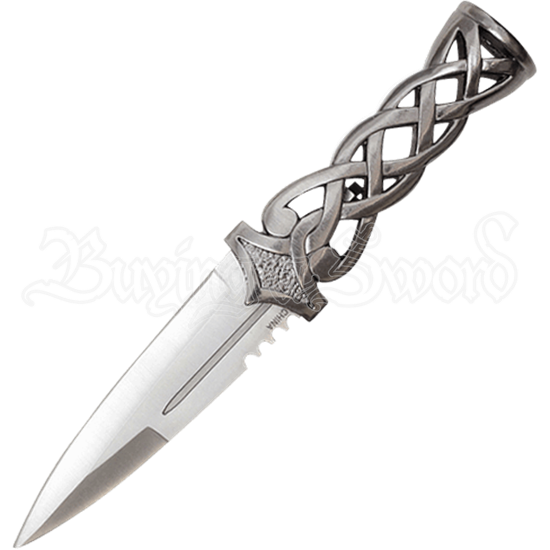 A beautiful reenactment accessory, collectible, or display piece, this gemstone sgian dubh presents a unique take on Highland heritage.